I had the best of intentions about slashing my food bills in February by sensible shopping. I think the lengthy post below can be summarised as ‘I really should follow my own advice’…but didn’t. Ideally, I would have loved to plan one big shop focused on fresh food. When supplemented with the stores we already have in the house, it would have been interesting to see how long we could hold out without shopping again. However, life tends to intervene. Everyone still has to be fed, whether it’s quick breakfasts, snacks after swimming, packed lunches for my husband or evening meals for everyone. I can’t just call a halt to all the eating while I pore over recipe books and plan. Also, in practical terms, I try to fit in shopping trips when it’s convenient. When the children were tiny, I ordered most of our food online. Now they’re both at school, it’s slightly easier to nip into the Co-op when I’m passing, or attempt bigger shopping trips at Morrisons when my husband’s around with the car. I’d rather avoid the internet delivery charges where possible, and by showing up in store, I can check out the reduced price shelves. Which is why I ended up running around Morrisons in a mini version of supermarket sweep on Sunday. 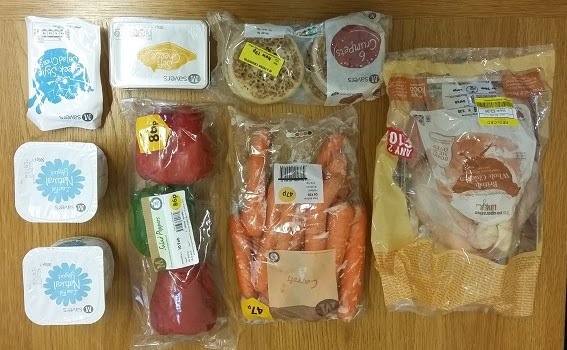 I wanted a copy of the paper with my heating oil article, and we’d run out of dishwasher tablets and ingredients for my husband’s packed lunch. We therefore made a quick diversion on the way to go swimming. I gave myself 10 minutes, and grabbed the heaviest items I could think of while the car was available. Normally staggering home with a 12.5kg bag of potatoes is not my idea of fun. So on Sunday I spent £16.75 ready for a frugal February – and still forgot the dishwasher tablets. 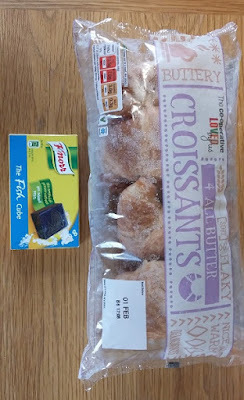 Which is why I ended up in the Co-op first thing on Monday morning, buying dishwasher tablets on offer, perusing the reduced shelves, and picking up a yellow-stickered cut price selection of croissants, fish stock cubes and 3 pears (kerching, another £2.13 on food). 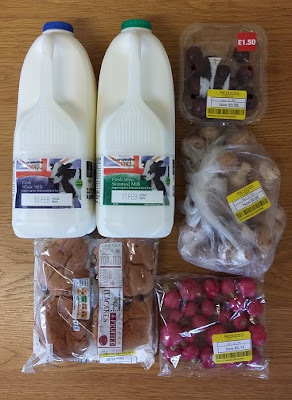 And on Tuesday morning we were out of milk, so again I nipped into the Co-op straight after the school run, and came out with not only milk (2 big bottles for £2), but also reduced radishes, reduced mushrooms, reduced cherries and reduced teacakes for future post-swimming snacks (kerching, another £3.44). Normally Tuesday evenings are a good time for supermarket shopping, because I can nip round Morrisons while my son is at Beavers and my daughter is at Brownies, and my husband does one trip to collect us all. However, I ran out of time to write a carefully planned shopping list, and we still needed all the fresh food I hadn’t bought on Sunday. Which is why I ended up bumbling round Morrisons on Tuesday evening, filling the trolley any old how. Late night shopping has pros and cons. 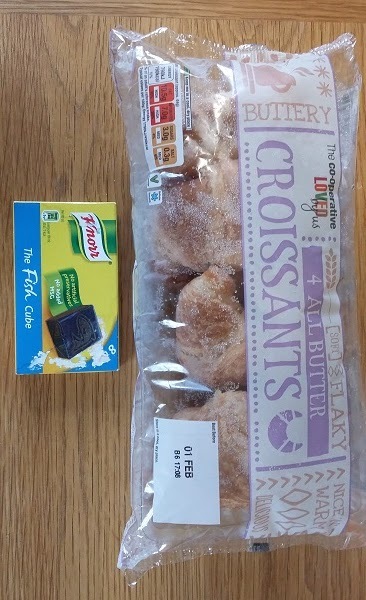 The children love it when I emerge with a marked down pack of doughnuts as a treat. The downside, as I discovered on Tuesday, is that some supplies may be out of stock. So rather than being able to stock pile some of my cheap and cheerful staples, I could only curse the empty shelves where I’d normally find Morrisons Savers natural yogurt, butter and soft cheese. – creme fraiche to make a sauce for the frozen leftover Christmas turkey along with the bargain Co-op mushrooms. But some items were bought more on autopilot, despite all my resolutions. 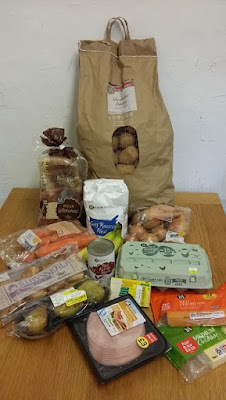 I bought several things where I already had stocks (reduced price croissants), or alternatives (tin of tuna) or was supposed to be cooking from scratch rather than buying processed food (frozen pizza for my husband, children’s favourite frankfurters) or looking for cheaper options (tortilla wraps) or avoiding more expensive out of season options (e.g. mango and seedless grapes). So much for a small shop just to last the week – I handed over £30.33 at the till. 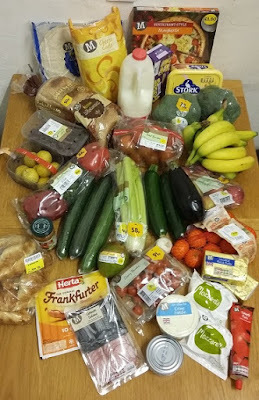 Also, because I decided not to buy more expensive replacements for the out of stock items, I nipped back to Morrisons on Thursday morning to buy the new deliveries (kerching, another £3.69 with some extras), and walked through the Co-op en route (kerching, £3.96 for a reduced price hefty whole chicken). The net result is that just 4 days into February’s frugal food challenge, aiming to buy as little as possible and use up food in the house, and I’ve managed to spend £60. On the bright side, none of my purchases will go to waste, and I did pick up a bunch of reduced price items that have either been eaten or frozen. – Don’t keep going to the supermarket! I started today by…not going to the Co-op. I’ll count that as a success. Anyone else start out with the best of intentions, and then go astray? Anyone? Life does sometimes get in the way doesn't it? I am impressed that your husband takes his lunch to work that saves a great deal. If you manage to only top up next week with milk, fruit you should be back on track. You are very lucky to have a grocery shop that you can walk to. How far is it? We're very lucky to have a high street nearby with useful shops. 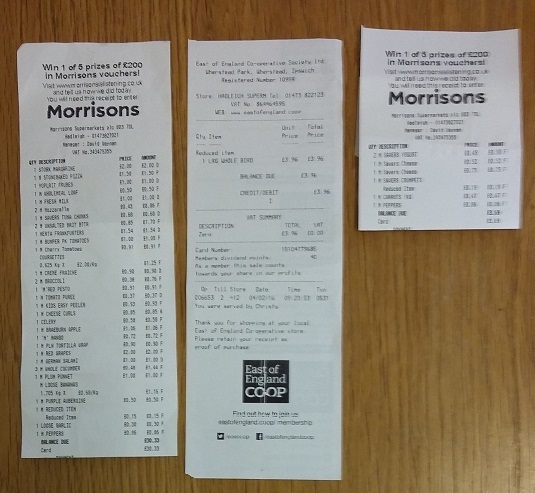 The Co-op is only up the road, and Morrisons isn't too far. I've just been playing around with MapMyWalk, and it reckons it's 750 metres from home to the Co-op (and only about 400 metres from the children's school to the Co-op). 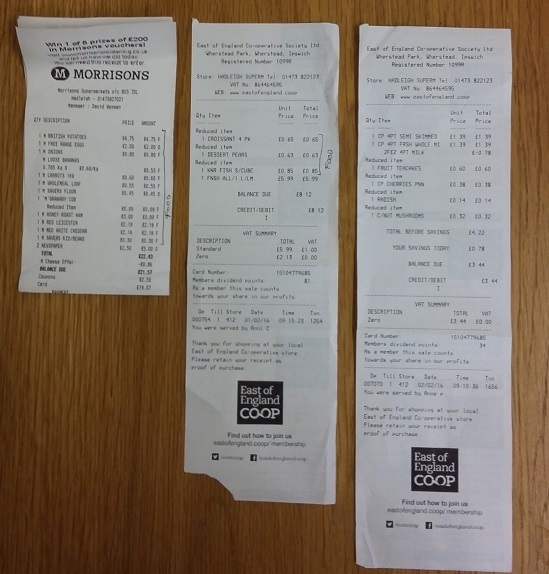 Morrisons is 1.5km away, so twice as far as the Co-op, but with a bigger range and cheaper prices. I think an Ooops is in order! Yes the proximity is a mixed blessing. It's great that I can do a round trip to the school, Co-op, post office, library and hardware shop and be back in an hour or so, but not so great when I start pottering round the charity shops! Life does get in the way – helping out a friend this morning ended up being 4 hours instead of 2 – and I had to ring my OH and get him to nip to the chip shop so we could have a hot lunch quickly before the afternoon commitments. But it was delicious!! That WAS a frugal shop to me, and there are only two of us here! But my list always includes not only food but toiletries and cleaning products and things like foil and sandwich bags which still have to be bought even when you are aiming to live frugally. I have a magnetic pad attached to the fridge/freezer and every time I use something up (or it's getting very low) I add it to the list. Then, before we go shopping, I transfer that scribbled food list to the list on the computer, but crossing off what we don't need from last week's list. With me thus far? Then I print the list – and I type it in order that the items appear in the supermarket (indeed, I have TWO printed lists: one for Waitrose and one for Lidl, our two preferred places) and this makes shopping as easy as it could be. In Waitrose we get a 'free' paper and 'free' coffee each, too, using our Waitrose loyalty in there we then share in the car park and enjoy that with our coffee! Our treat is to have a sandwich (bought in Waitrose) which we share, half each. That very often constitutes our lunch if we've shopped late-morning, or breakfast if we've shopped fairly-early-morning! I also have places in the larder where things always 'live' so that I can see what's missing at a glance and I put the same items in the same drawers in the freezer so again I can see what's missing when I do a quick look-see before shopping, just to make sure everything we need is on the list. I can't claim to be 100% organized, but the best way to shop is to aim to be Organized All The Time. List on fridge or larder, transfer this to printed list before shopping. Job done! The lists and the specific places for specific things sound very sensible. I often start lists of what we need, when I notice it, but then misplace the list. Your magnetic pad is a great way to make sure the list doesn't go missing! I meant to say that I don't just cross things off the printed list, I actually delete them, so the list that goes shopping with me is exactly what we need for that week. PS The magnetic pad is by Booths Designs, is about a fiver by post, and has about 70 pages so that should keep you going for about a year at about a page a week. The pad I have has a design of tea pots at the top of each page which actually looks quite attractive in the kitchen. No point in having a pad facing you for a year that you don't like the look of! PS When my husband worked (he retired in 1998) he always took his lunch to work. This was normal in the days before everyone seemed to rush into a supermarket for sandwiches or Pret a Manger or Starbucks for a hyper-costly coffee. Oh dear, yes, I've definitely been there. I live in a small village and have to drive to get to any shop, which does mean I can go quite a long time with minimum shopping as I'd rather not bother! I do shop slightly differently in that I try to keep a bit of a stockpile. Not in a mad survivalist prepper-type way, I just feel better knowing I have a store of meals in any eventuality. It needs sorting out now though, with too many bits and pieces, hence the frugal February. Good luck with frugal February! I have limited food storage space, and with the shops so close I try to avoid buying many spares. Not as bad as one friend years ago, who lived opposite an all night supermarket. He never had any food in the house, just crossed the road to buy some when needed! I used to have huge stockpiles (we have plenty of space to do so, which isn't necessarily a good thing!) but have made real efforts to use them up and just maintain a reasonable level of items instead. I make lists whenever possible, mostly because any shops are at least a twenty minute drive for us, if I forget something I never just nip back so I see what I've got that I can use instead, but that's easier, MUCH easier when there are just two adults in the house. I keep 2 lists on my fridge, 1 – a shopping list and 2 – a list of the meals I plan to make, and when. The lists themselves are unused paper from my printer. Often a 2nd page is printed with a few lines which aren’t needed or half a page can be cut off. I then clip these together and use as a recycled notepad. When I shop I buy as many bargains – usually yellow sticker and that I know my family and I will eat. When I get home I add to my meal planner list meals available from what I’ve bought. -If I have a glut of fruit, I wash/Hull/chop and freeze any that I know wont keep before we have a chance to eat them fresh. These are great for making smoothies for the kids. -When I buy meat I freeze it straight away or if I also have a glut of veg I batch cook stews, casseroles, soups etc, then freeze. -Another option with veg is I make my own bags of mixed veg to freeze. Just Blanche them, bag them and freeze.